Entrance fees at the sightseeing spots. Airfare for Khajuraho : Varanasi and Varanasi : Delhi. Arrive Delhi in the evening. Upon arrival, you shall met & assisted with your baggages at the airport by our executive and transferred to the hotel. Morning sightseeing tour of Old Delhi. Visit Jama Mosque, Red Fort from outside, Rajghat - Mahtma Gandhi’s cremation place, drive past through India Gate, President House, Rajpath, Government buildings, Qutab Minar Lotus (Bahai temple). Overnight stay at Hotel. Morning drive to Jaipur, on arrival check-in at Hotel, in the evening visit Birla temple at the time of prayer ceremony. Overight say at Hotel. Morning sightseeing tour of Jaipur city includes Photo stop at Hawa Mahal: the palace of winds, Jantar Mantar: the observatory on stone and the City Palace Museum which contains the original collection of the Maharajas of Jaipur. Later visit Amber Fort. At Amber Fort you climb up the fort on Elephant's back like the Maharajas and visit the Amber) Palace of the Kuchchawa rulers. Overnight stay at Hotel. After breakfast, leave for Agra. Enroute visit the abandoned Mughal city of Fatehpur Sikri : built by Emperor Akbar in 1569, was the old capital of the Moghuls, which was abandoned after 15 years due to scarcity of water. Continue drive to Agra. Arrive Agra and check-in at Hotel. Overnight stay at Hotel. Morning sightseeing tour of Agra city, Visit the Red fort, which was built by Emperor Akbar in 1565, and additions were made up until the time of his grandson, Shah Jahan. Itmad-ud-daulah, which was contructed by Nur Jahan between 1622 and 1628 and is very similar to the tomb she constructed for her husband, Jehangir,. The Taj Mahal, which was constructed by Shah Jahan in memory of his wife Mumtaz Mahal. Contruction of the Taj began in 1631 and was not completed until 1653. Later drive to Gawalior, on arrival check-in at Hotel. Overnight stay at Hotel. Day 7: Gwalior - Orchha : By Surface 120 Kms. 2.5 Hrs. After breakfast in the morning sightseeing tour of Gwalior city, visit the Gwalior Fort - The Mughal emperor Babar referred to the Gwalior. Later drive to Orchha, on arrival check-in at hotel. Gwalior once the capital of Bundelas Dynasty , Orchha is a village, set amongst a complex of well preserved palaces and temples. Rest of the time at leisure for independent ativities. Overnight stay at Hotel. In the moriing visit Orchha city, he highlights of orchha are Jehangir Mahal, Raj Mahal & Ram Raja temple which also dates back to the 17th century. Later drive to Khajuraho, on arrival check-in at Hotel. Overnight say at Hotel. 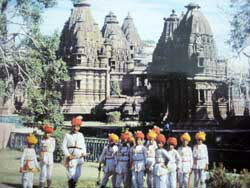 In the morning visit he world famous Khajuraho temples built by the Chandela Kings. Visit the Chaunset Yogini temple dedicated to Goddess Kali, the Mahadev temple, Chitragupta. In the afternoon transfer to the Airport to board the fligh for Varanasi, meeting on arrival and transfer to the Hotel. Overight stay at Hotel. Early morning boat rides on the holy river Ganges to view the sunrise where the Hindus perform their morning prayers. Later sightseeing tour of Varanasi temples visiting Bharat Mata temple, Banaras Hindu University, Vishwanath Temple, Hanuman Temple, and Old City market. Afternoon excursion to Sarnath the place where Buddha preached his first sermon. Overnight stay at hotel. Depart Delhi: In time transfer to the Airport to board the flight for Delhi, on arrival connect the flight for onwards destination.